Deputy Premier and Minister for Regional NSW John Barilaro and the Member for the Upper Hunter Michael Johnsen turn the first sod. 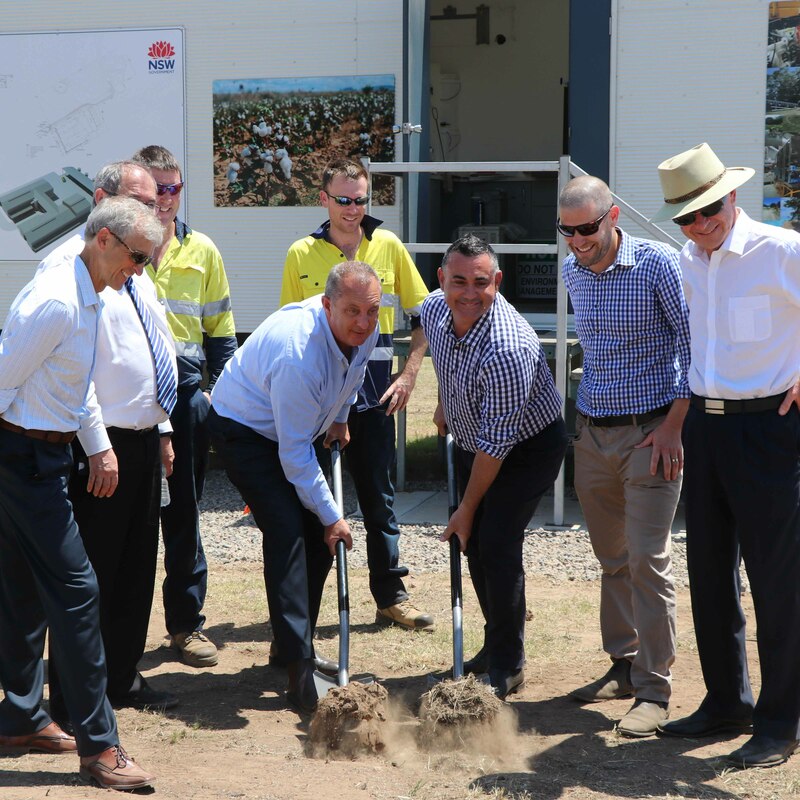 Deputy Premier and Minister for Regional NSW John Barilaro and the Member for the Upper Hunter Michael Johnsen visited the site today to officially launch stage one building work for the project. In partnership with Muswellbrook Shire Council and the University’s Newcastle Institute for Energy and Resources (NIER), Ethanol Technologies (Ethtec) is developing an environmentally sustainable process to produce biofuels and other renewable chemicals from crop and forestry waste. “Muswellbrook is already an energy hub for the state and will now be home to a centre for world-class research into renewable and clean energy. “With regional NSW already a breeding ground for innovation, our investment in the Hunter Pilot Biorefinery has proved yet again regional industries bring incredible opportunities to the state in new business, skills, education and jobs." Stage one of the Hunter Pilot Biorefinery received $4.6 million from the NSW Government under the Growing Local Economies fund, established by the NSW Liberal and Nationals Government to unlock long-term growth opportunities in regional NSW through targeted infrastructure investment. Ethtec Senior Biotechnologist and University of Newcastle Conjoint Lecturer, Dr Geoff Doherty, said the Hunter Pilot Biorefinery had the potential to transform the agricultural and forestry sectors. Executive Director Newcastle Institute for Energy and Resources (NIER), Professor Alan Broadfoot, said the facility built on the University's existing world-class research in energy and resources. "The facility aligns with a global push to capture value from forestry and agricultural waste streams. It has the potential to bring new and innovative skills to the Hunter region, complement existing industry and support economic diversification in the area." “The work that will be conducted in these buildings is of international significance. Putting the Hunter at the forefront of bio-renewables research and development will be an incredible achievement which will benefit the whole community,” Mr Johnsen said.